Background: Glycyrrhetic acid (GA) is the active metabolite of glycyrrhizin and glycyrrhetate. Diammonium glycyrrhetate and ammonium glycyrrhetate are common ingredients of the clinical prescription. And few analysis methods applied to the pharmacokinetics of ammonium glycyrrhetate in human were reported. Objective: This work aims to develop a chromatography-tandem mass spectrometry (LC–MS/MS) method to determine glycyrrhetic acid (GA) in human plasma for the pharmacokinetics study of ammonium glycyrrhetate. Methods: Extraction of GA and I.S. (internal standard, thiamphenicol) from human plasma was carried out by liquid-liquid extraction with ethyl acetate. The reconstituted samples were chromatographed on a C18 (150 mm x 4.6 mm, 5 µm particle size) by elution with acetonitrile- 5 mM ammonium acetate (70:30, v/v). Ion transitions of m/z 469.3→355.3 for GA and m/z 354.0→185.0 for I.S. 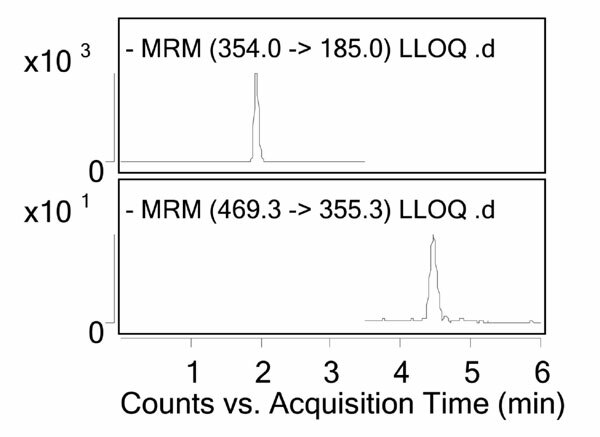 were detected by tandem mass spectrometry in the negative ion multiple reaction monitoring (MRM) mode. Results: Method validation demonstrated that the method was of satisfactory specificity, sensitivity, precision and accuracy in linear ranges of 0.4 - 400 ng/mL (r2>0.99). Analytes were stable in plasma samples after being long stored and two freeze–thaw cycles, and in post-extracted samples at room temperature. The method was successfully applied to support a clinical pharmacokinetic study of ammonium glycyrrhetate. Conclusion: We develop a rapid, simple, sensitive and specific LC–MS/MS method for the quantification of glycyrrhetic acid (GA) in human plasma. Keywords: Glycyrrhetic acid (GA), LC–MS/MS, pharmacokinetics, glycyrrhizin, glycyrrhetate, human plasma. Affiliation:Key Laboratory of Cancer Prevention and Therapy National Clinical Research Center for Cancer, Tianjin Medical University Cancer Institute and Hospital, Tianjin 300060, P.R., Clinical Laboratory, Tianjin Third Central Hospital, Tianjin 300170, P. R., Key Laboratory of Cancer Prevention and Therapy National Clinical Research Center for Cancer, Tianjin Medical University Cancer Institute and Hospital, Tianjin 300060, P. R.
Keywords:Glycyrrhetic acid (GA), LC–MS/MS, pharmacokinetics, glycyrrhizin, glycyrrhetate, human plasma. Abstract:Background: Glycyrrhetic acid (GA) is the active metabolite of glycyrrhizin and glycyrrhetate. Diammonium glycyrrhetate and ammonium glycyrrhetate are common ingredients of the clinical prescription. And few analysis methods applied to the pharmacokinetics of ammonium glycyrrhetate in human were reported.